Nanaimo-Info-blog: The Long Lake 360? Is This The Long Lake 360 Mini-Yacht Race? 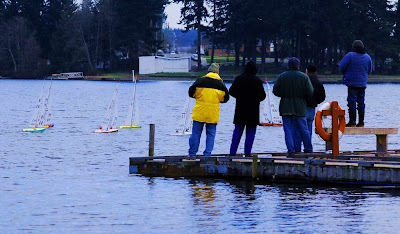 The other day Long Lake was the location for a flotilla of mini, remote controlled yachts as their skippers skillfully put them through their paces. It is not known if the mini ships are under power as well as sail, but I presume they are, just like the larger versions. These big boys with their big boy toys were having a blast even though they had to shield themselves from one of the famous Nanaimo Nor Westers that was coming across the lake.